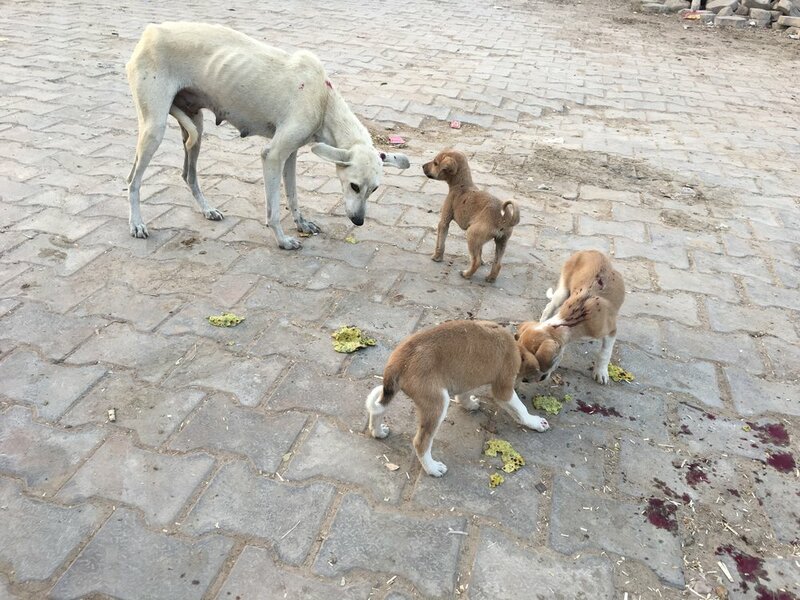 My first journey to India was life changing in so many ways, but like many other travelers, I was deeply disturbed by the sight of the dogs on the street. Dogs are for the most part not kept in homes as pets, but left to live out on the dirty streets. They are not typically treated as man’s best friend or for the loving creatures they truly are. I promised myself that if I ever had the opportunity to return to mother India, I would have to do something for her beloved dogs. As it turns out I did get the amazing chance to not just visit but live in India for six months in the small town of Jatipura by the sacred Govardhan Hill, a site of great religious significance for Hindus and especially followers of Lord Krishna. In Jatipura there are well over 50 helpless and homeless dogs in just one single village, with many hundreds more in and around the other 4 villages surrounding the sacred mountain. And so I began a project very close and dear to my heart: “dog seva.” At first many people objected, “Why don’t you serve and feed the sacred cows instead?” but I felt that the dogs are in even more pitiable condition and in need of care. Hardly anyone sees them as worthy of compassion, much less as sacred living beings. They suffer terribly from mange, worms, starvation, cold, injury and physical abuse. 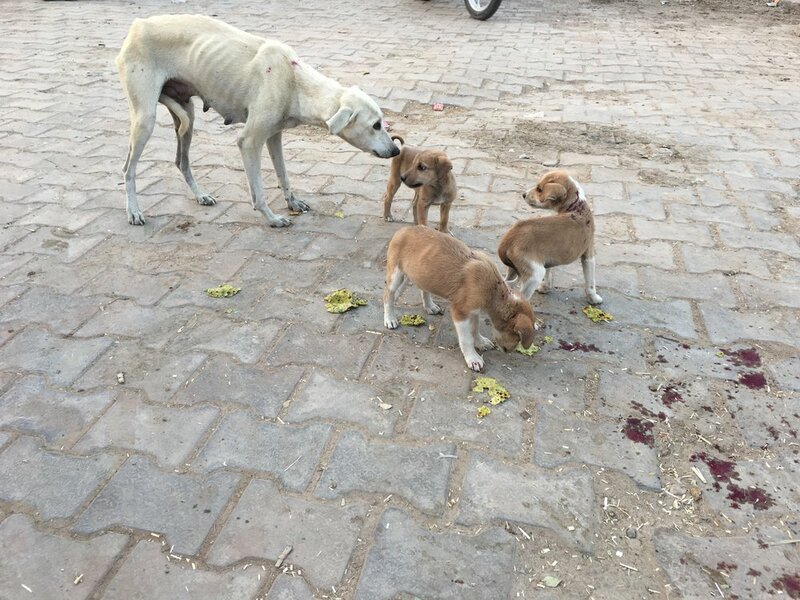 With the help of my fiancé and our best friend Madan Mohan, we set off on a mission to first feed these starving beauties, and secondly to get them some basic medical assistance. From our own resources we were able to distribute among the dogs 30 handmade rotis (whole wheat breads) every day when we went out to walk in the afternoon. 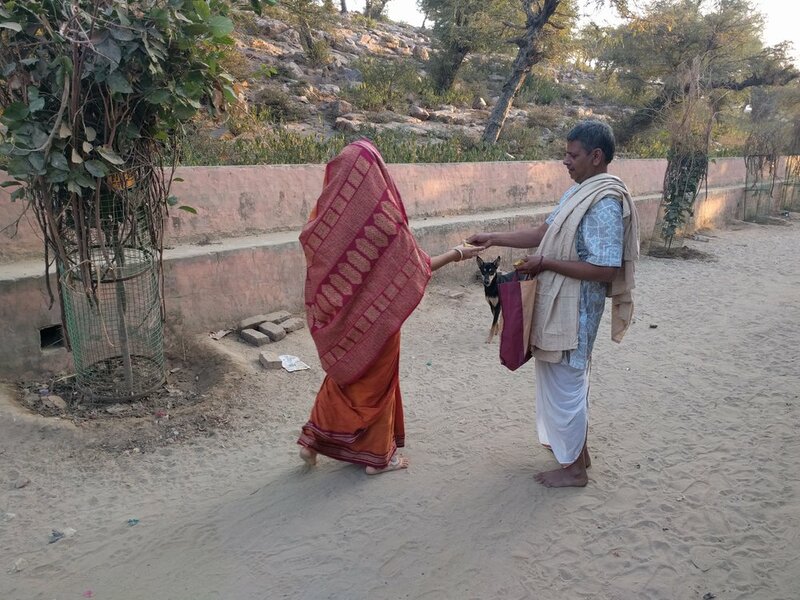 Also, with the support and guidance of Chandi Mataji, an animal rescuer in Vrindavan, we were able to obtain the medicine Ivermectin, which we used to medicate the dogs to combat mange and worms. We dyed the dogs with holi colors so we could tell who had gotten their dose of medicine and who still needed it. We saw positive results in nearly all the dogs treated, and some showed dramatic reversal of disease. One sweet little dog I named Sparky was so diseased and disturbed when we first tried to feed him that he kept chewing on small rocks instead of taking the bread. But after he started taking rotis from us and eventually the medicated sweets, all signs of mange slowly vanished and he began eating and behaving like any other dog. Although I am no longer physically there in Jatipura, I hope to visit again soon. In the meantime we have arranged for Mohan and one other assistant to do some dog seva in our absence, feeding the dogs more rotis which they love and desperately need. While some villagers do feed food scraps to the dogs and many children try to play with and feed puppies, the vast majority of the dogs subsist on what they can find in the trash and the sadly chemical-laden milk that runs off in a gutter near the main temple. My goal in befriending the neighborhood dogs is not only make it more feasible to do a catch and release neutering project for them in the future, but also to demonstrate to the locals and tourists in the town that humane and kind treatment of animals is an essential trait of human decency as well as spirituality which the majority of them claim to be pursuing at this pilgrimage site. Your contributions to this humble but demonstrably direct-impact project will help us pay for the food and cooking supplies, Mohan and an assistant’s time, travel and efforts, more medicine and eventually, I hope, the professional care of a licensed veterinarian and a neutering project. Stay tuned, my friends, and thank you for taking part in this project with us! Every donation makes a big difference! Even just a dollar a day would pay for rotis for most of the dogs in our village. After that we would love to offer some nutritional powders, peanut butter and more medicine, to expand the program to the nearby villages, and then to save up for more thorough medical treatments like trained vets to carry out a neutering program.